Fishing lures have a connection to Hawaii’s past, but they weren’t always as detailed as today’s lures. Throughout history, lawai’a (Hawaiian fishermen) not only carried traditional fishing knowledge but also how to craft and effectively use their equipment. In an era absent of plastics and metals, they turned to natural materials and ingenuity to create lures. Aku, or skipjack tuna, was a staple food source for Hawaii — and still is today. The pa hi aku was a favorite lure to use when targeting skipjack. This traditional lure was crafted using an iridescent pearl oyster shell, a hook made from bone, and pig bristles crossed at the base of the hook. Dragged behind a canoe, the lure shined in the sunlight as its bristles created a trailing ripple to entice aku to strike. Predating modern fishing nets, the hina’i (basket fish trap) may have been the earliest form of “net” used by Hawaiians. The funnel-shaped basket was crafted using a stone base and the aerial roots of the ‘ie’ie, an indigenous, woody vine found in forests at elevations above 1,500 feet. Used to target a variety of reef fish, a hina’i would be baited and left on the ocean floor. An interior cone allowed fish to enter the basket but made it difficult to leave. Hina’i were made in various sizes and were extremely durable, often remaining in families for generations. Fishing lures have evolved greatly over time, but behind the modern materials and production, the basic principle of attracting fish remains unchanged. 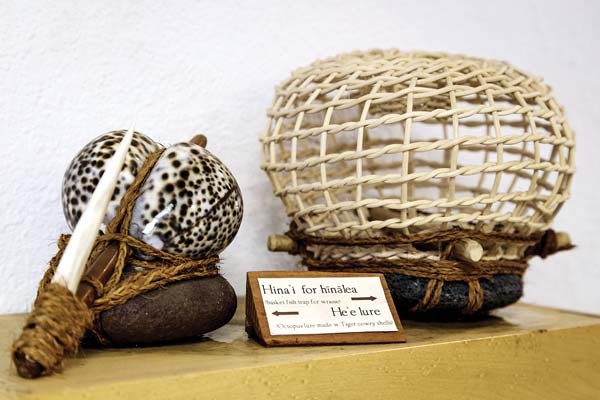 At the Maui Ocean Center, replicas of the pa hi aku, luhe’e, hina’i and more are displayed in the Hawaiians and the Sea exhibit, while rare artifacts are exhibited in the new Kaho’olawe exhibit (courtesy of the Kaho’olawe Island Reserve Commission). Remnants of Hawaiian fishing lures are just one of many implements that bring us back to Hawaii’s past and remind us of the ingenuity during this time period. * Evan Pascual is the marketing and public relations coordinator at Maui Ocean Center. “Ka Mo’olelo Moana,” or “the Ocean Story,” is a monthly column submitted by Maui Ocean Center staff members. 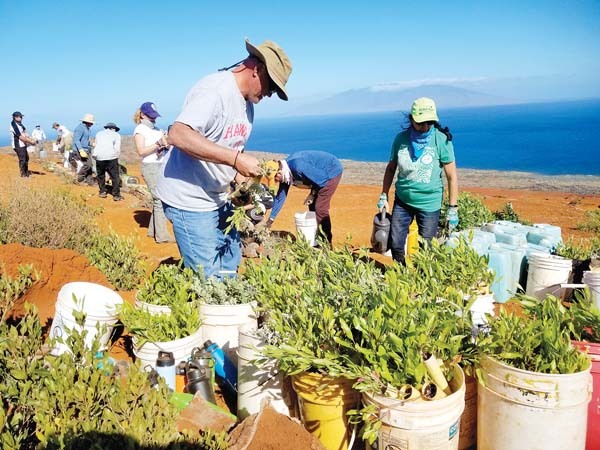 The center is open from 9 a.m. to 5 p.m. daily in Maalaea. For more information, call 270-7000.